It’s Almost Time For …. 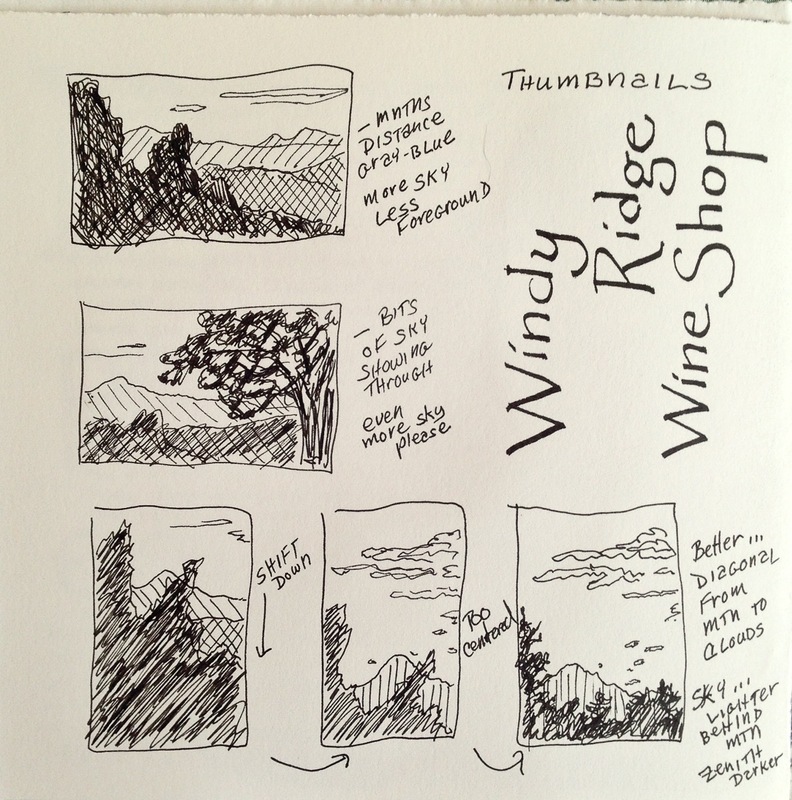 This is my second year participating and I’m gearing up for 31 days of pen and ink art. The “rules”, if you can call them that, are simple. 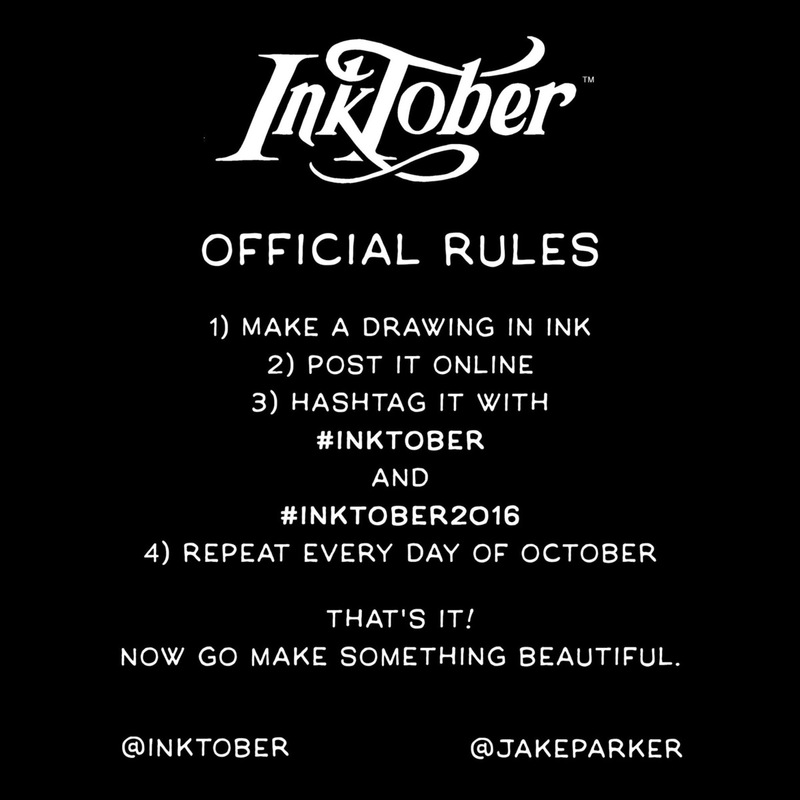 Jake Parker, the creator of InkTober says: Note: you can do it daily, or go the half-marathon route and post every other day, or just do the 5K and post once a week. What ever you decide, just be consistent with it. INKtober is about growing and improving and forming positive habits, so the more you’re consistent the better. 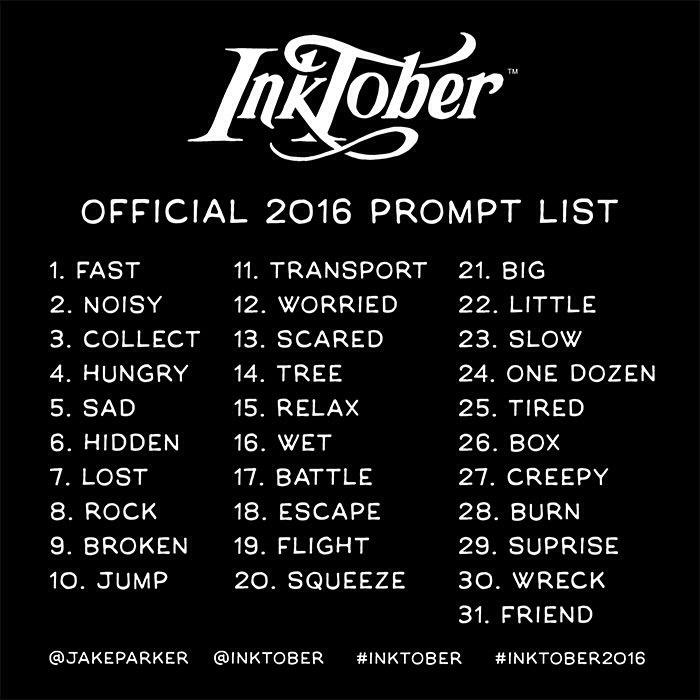 This year Jake Parker has created a list of prompts to use if that appeals to you. It’s not really my thing; I usually prefer to choose my own subject but as they say, “never say never”. I’ll keep an eye on the prompt list and maybe there’ll be some synchronicity. Oh, what to use… does it really matter? I pulled out my entire arsenal today. I’m ready! 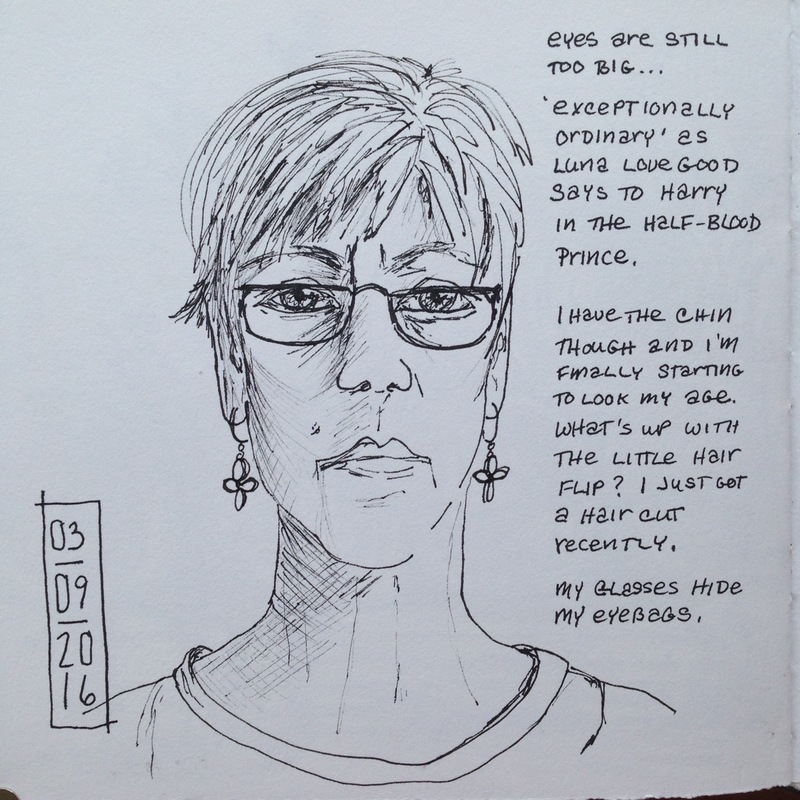 I’m hoping to post my pages here as I did last year… daily through October. Wish me luck! Last week was the Tunbridge World’s Fair, tucked into a hollow in Vermont’s Green Mountains. There’s always plenty of cows, goats and swine at this country fair. It has THE BEST prize-winning cakes, jams and pickles, huge pumpkins and incredibly clever scarecrows. 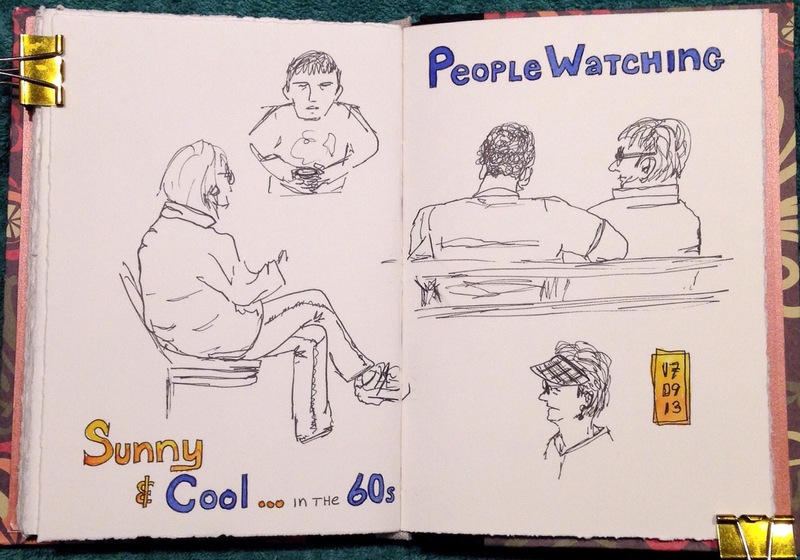 I’ve documented all this in my sketchbook over the years but this time something special caught my eye. A bird. 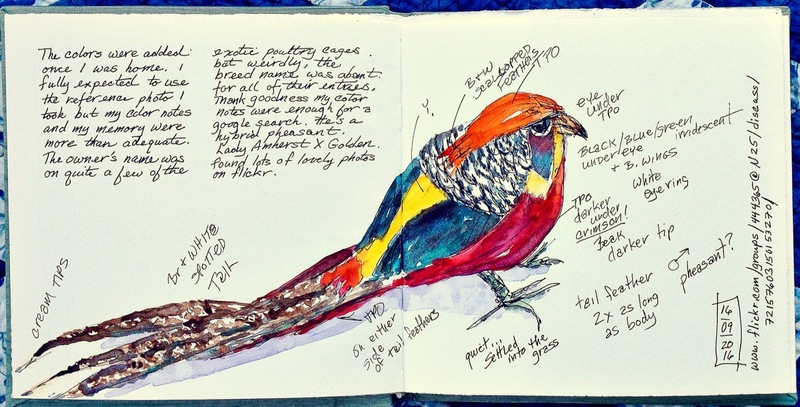 Not just any bird… a vibrant, colorfully feathered creature. 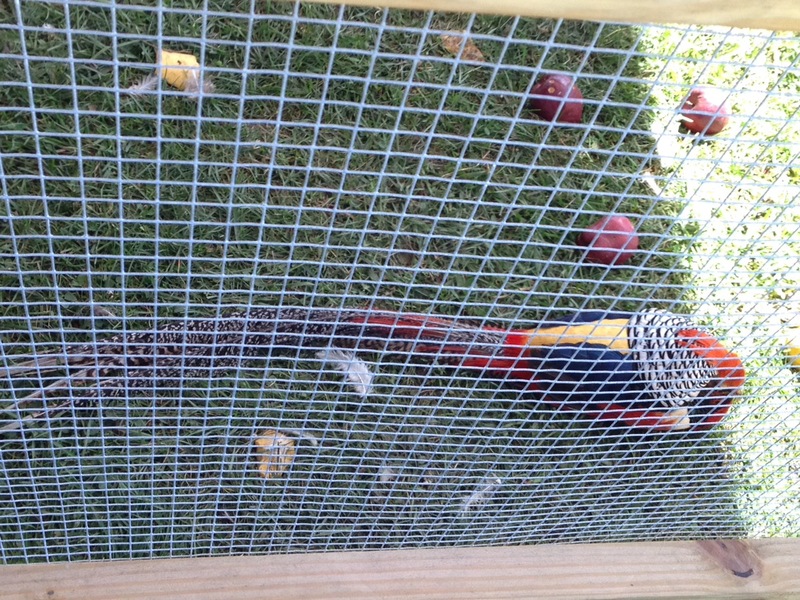 Not a fancy chicken or even a Guinea hen… a pheasant maybe? I could have taken a photo and walked on… but what’s the fun in that? 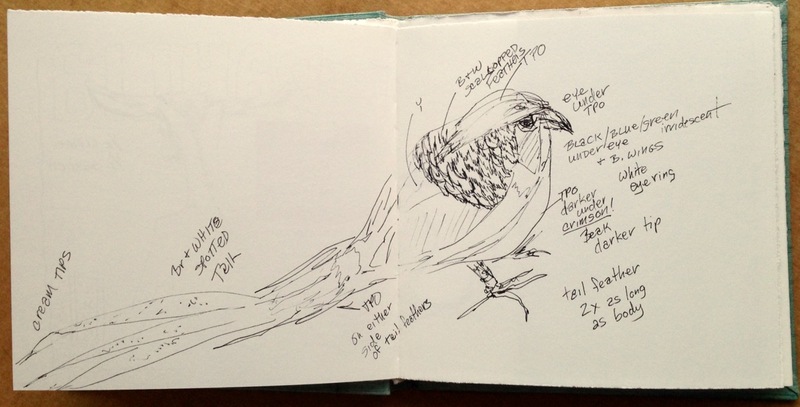 Instead I drew this glorious thing with feathers, annotating my sketch with all the pertinent info. I had already decided that adding paint here would be a disaster… I’d do it at home. 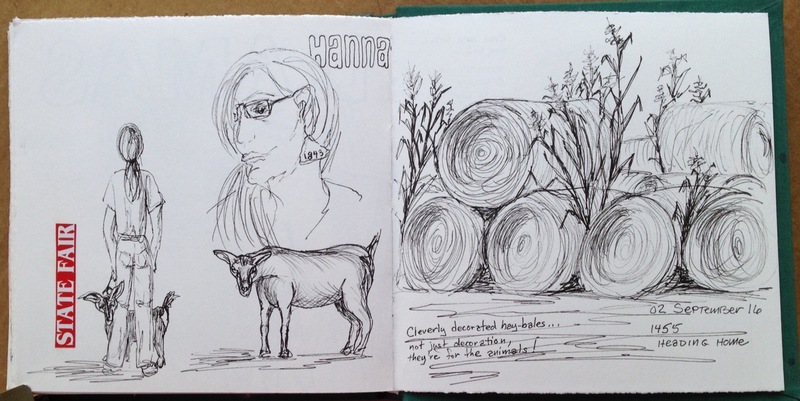 My comprehensive notes allowed me to complete the spread without even looking at the two reference photos I quickly took before moving on. He’s beautiful, he’s exotic. But what IS he? Google to the rescue. 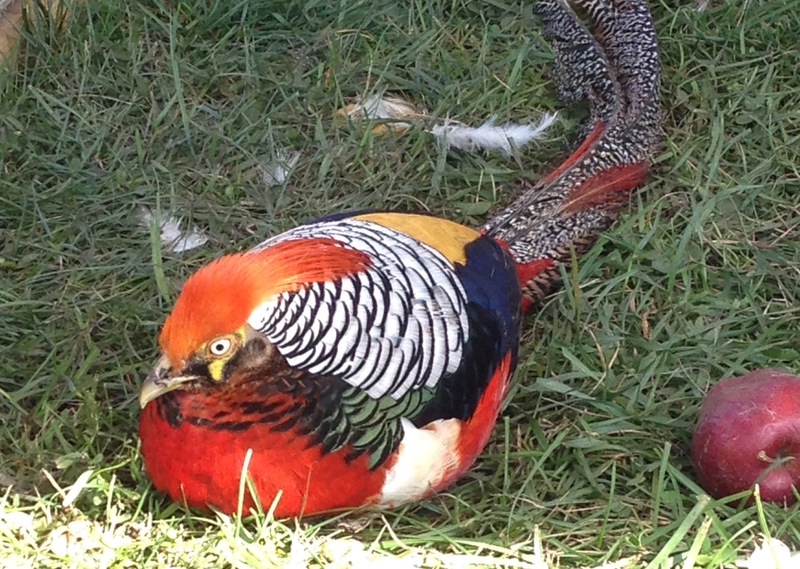 It seems he’s a cross of two Asian pheasants, a Golden and Lady Amherst’s hybrid. And a well positioned lens view through the cage. Next summer be sure to make time in your busy schedule to visit one of your local fairs. You never know what you’ll find. 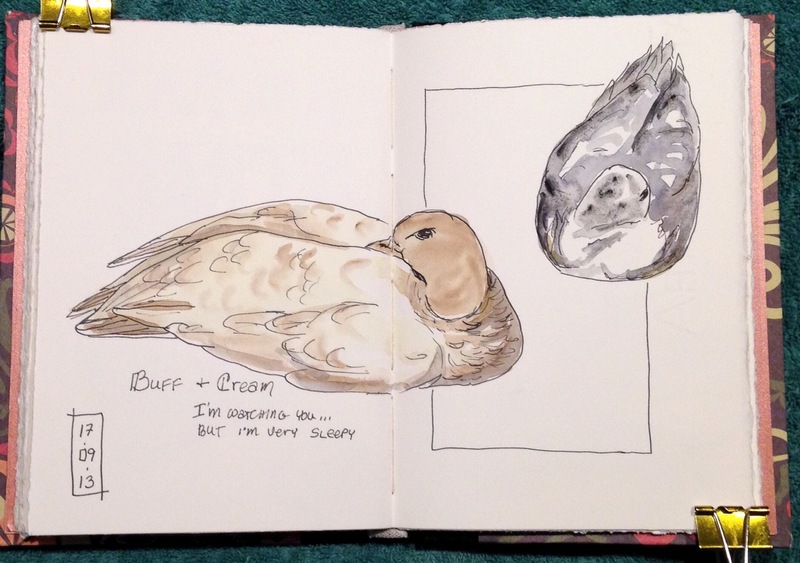 I’m comfortable with my supplies and set up so my biggest issue is my sketchbook. 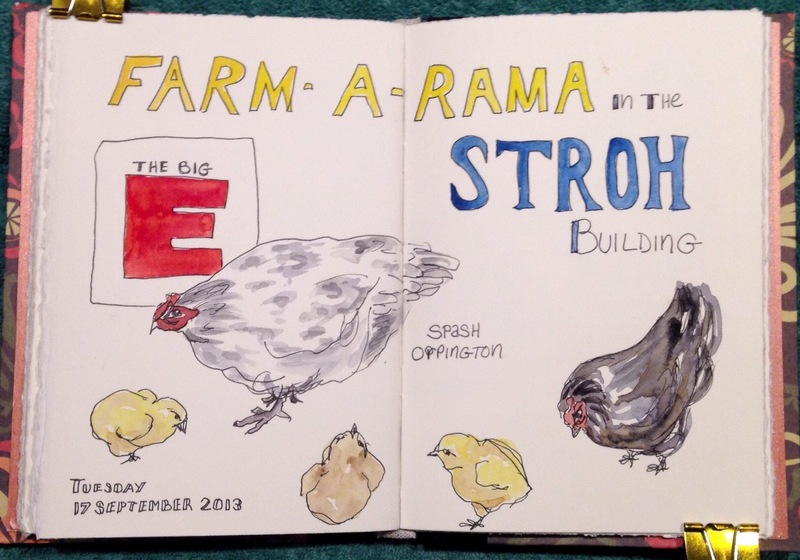 I thought I had plenty of room in my journal last Friday when I went to New Hampshire’s Hopkinton State Fair but in reality I could have used a few more. 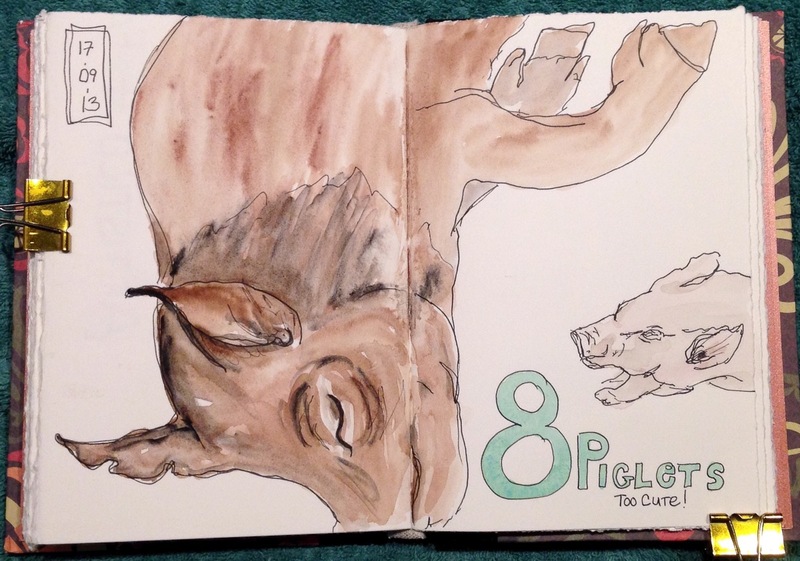 As it was, I finished 9 full spreads. 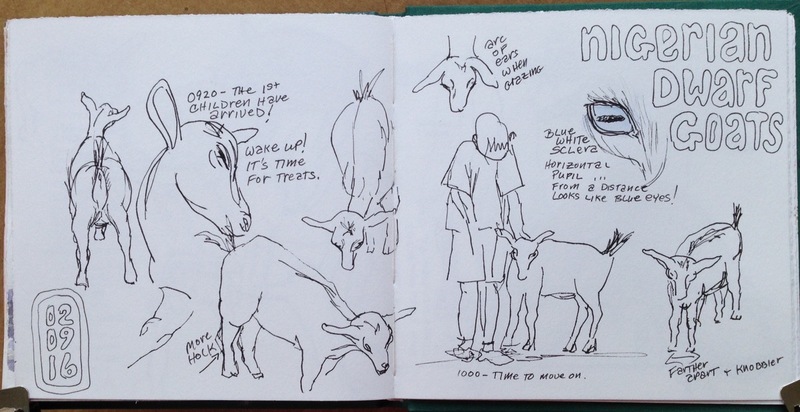 The pygmy goats at the petting zoo are perfect models for my warm-up pages. 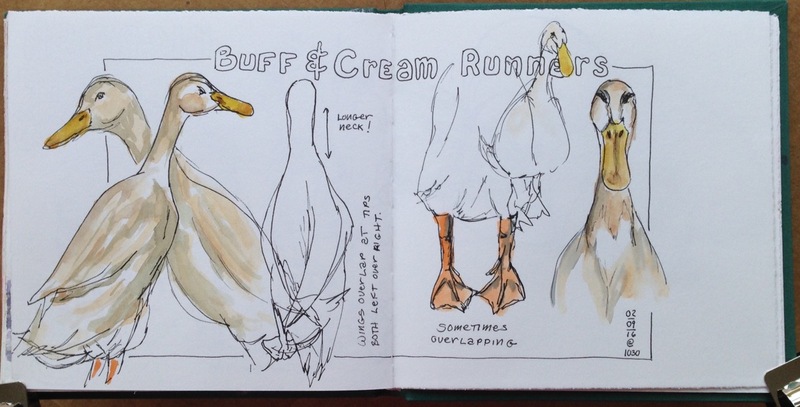 I have a thing for Runner Ducks! 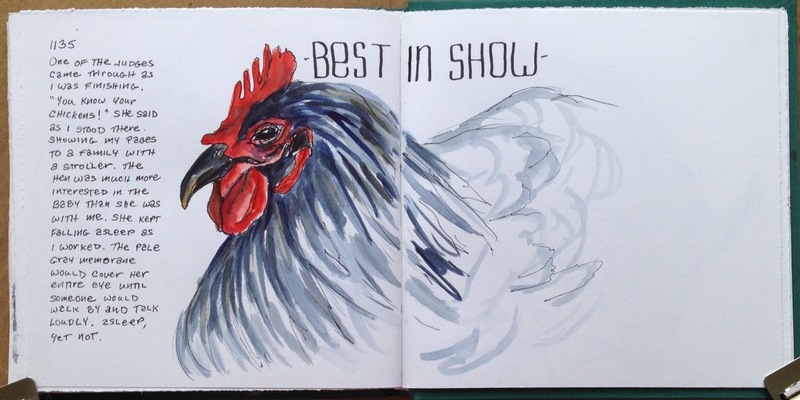 As I was drawing this Australorp hen, the judge came up and told me that I “knew my chickens” as she hung up the Best in Show sign. Cool! 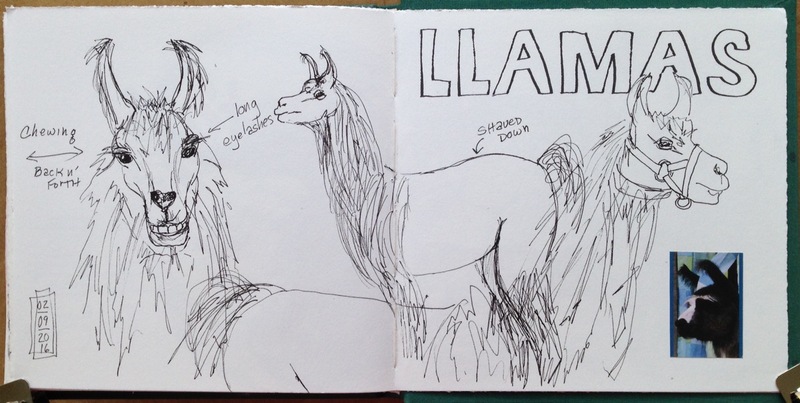 I learned that yes, Llamas spit, but mostly at each other! No pages left… I guess it’s time to go! 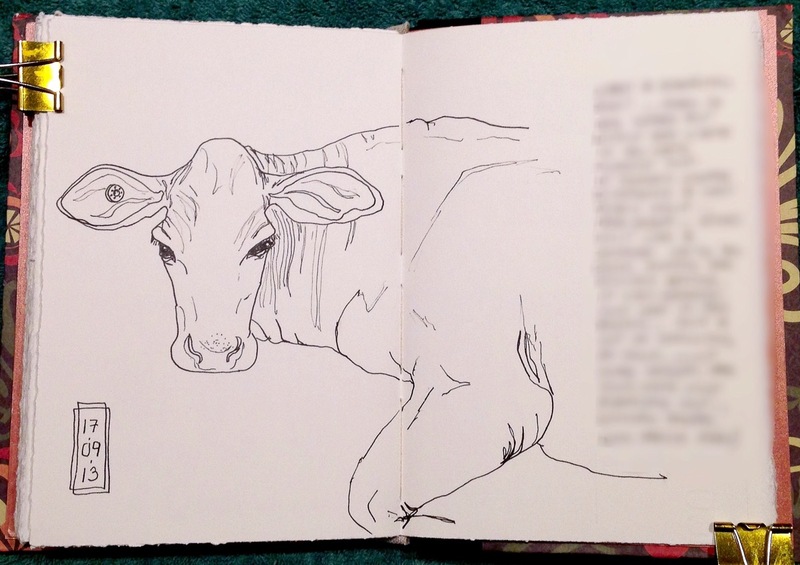 I have another fair to attend next week but this time I’ll have my new sketchbook. Lots of blank pages to fill! Over the last few years I’ve had the pleasure of reading all three of the Carding Novels by a local author, and my friend, Sonja Hakala. The Road Unsalted, Thieves of Fire and her most recent, The Dazzling Uncertainty of Life have been a pleasure to read. 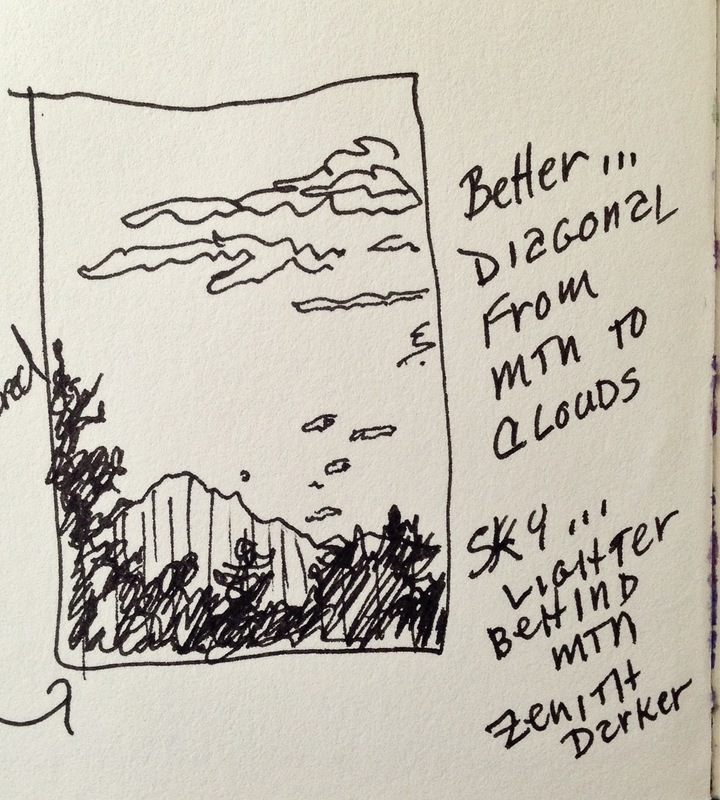 I love that I can recognize some of the locations and was thrilled when Sonja asked me to contribute one of my sketches to help illustrate one of the short stories that make up the Carding Chronicles featured on her blog. Thank you Sonja, it’s been an honor! 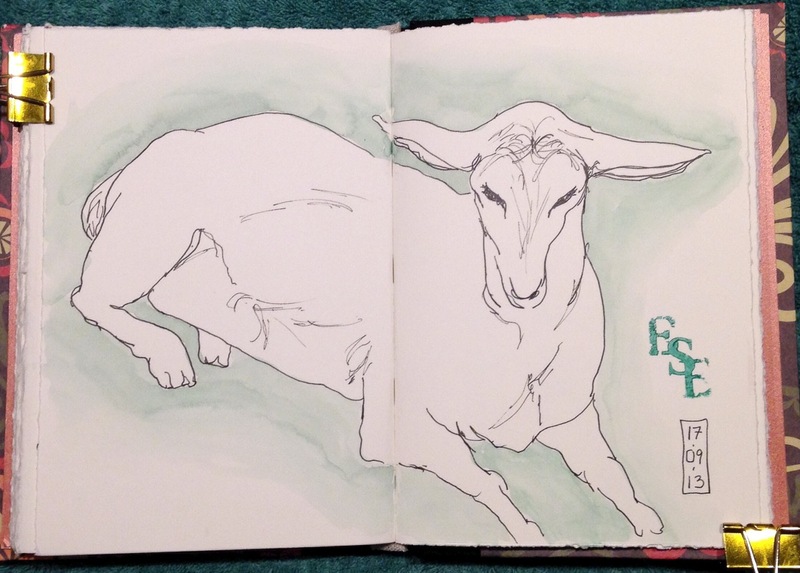 I did this goat sketch in 2013 and thought I’d easily be able to link to other sketches done the same day, that was before I realized they pre-date this blog by a few months! 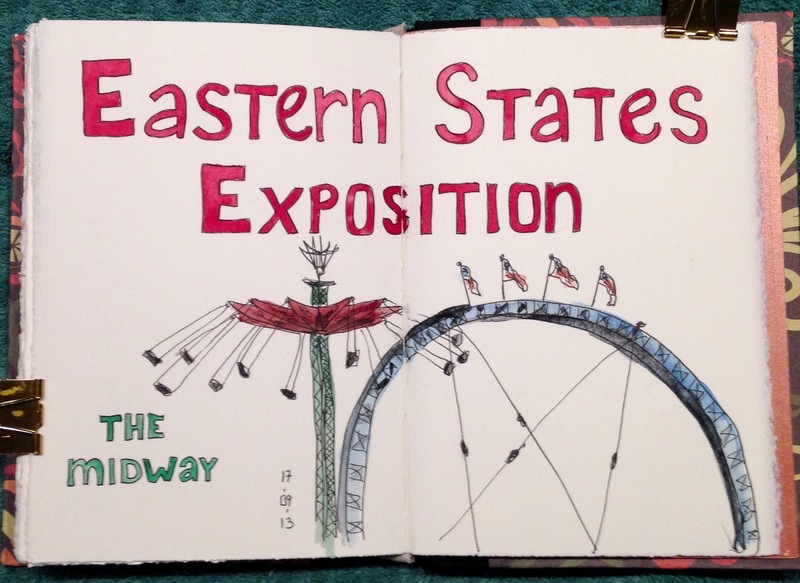 By the way, ESE stands for Eastern States Exposition, also known as The Big E! As you can see, I love the fair. 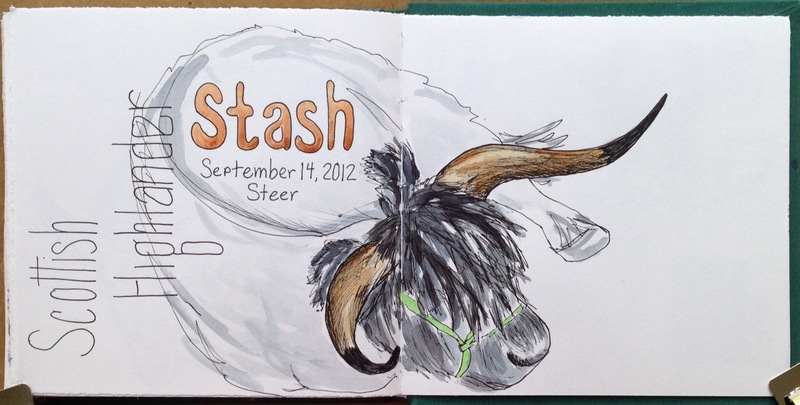 There’s so much to see and draw that I have to make sure I have plenty of pages left in my journal before I leave home. Hmmmmmmm….. Some of these people look like they could be Carding folk. I guess you’d have to read to find out for yourself!